41130 Rollercoaster is a Friends set released in June 2016. This is a description taken from LEGO.com. Please do not modify it. 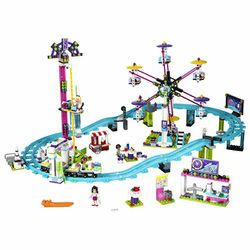 (visit this item's product page) Go crazy on all the rides at the Amusement Park! Food accessory elements include 2 boxes of popcorn, 2 watermelon slices, apple, hot dog with bun, water bottle and a soda bottle. Grab a delicious box of popcorn, hot dog or slice of watermelon from the dining area. Roller coaster train with 4 carriages measures over 1” (3cm) high, 6” (17cm) long and 1” (3cm) wide. Roller coaster track measures 27” (71cm) long. Ferris wheel measures over 12” (31cm) high, 11” (29cm) wide and 4” (12cm) deep. Drop tower measures over 12” (33cm) high, 4” (12cm) wide and 2” (6cm) deep. Entrance booth measures over 2” (7cm) high, 4” (11cm) wide and 1” ( 3cm) deep. Popcorn cart measures over 1” (5cm) high, 1” (5cm) long and under 1” (2cm) wide. This page was last edited on 20 January 2018, at 16:17.